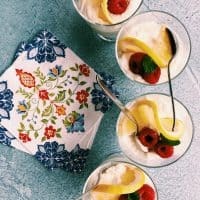 Sweet and tangy Light Lemon Cheesecake Mousse recipe is an easy, no-bake, bright and flavorful dessert for Spring. 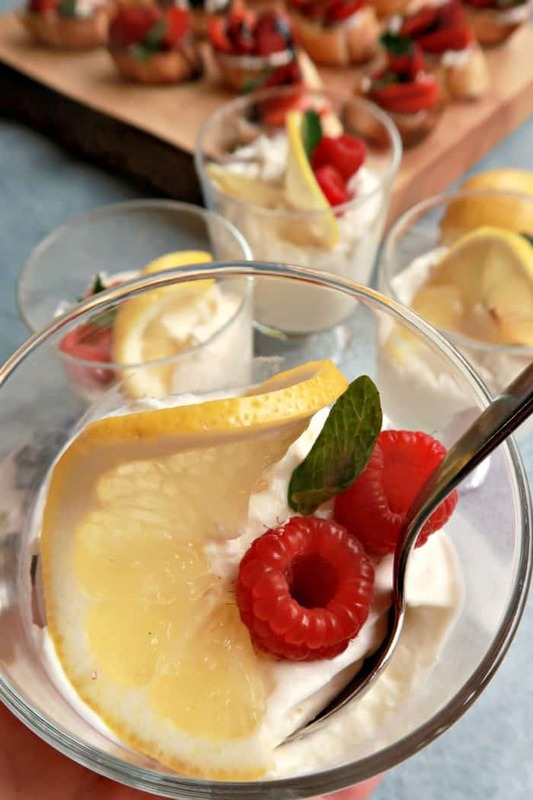 Garnish with lemon, raspberries and mint! 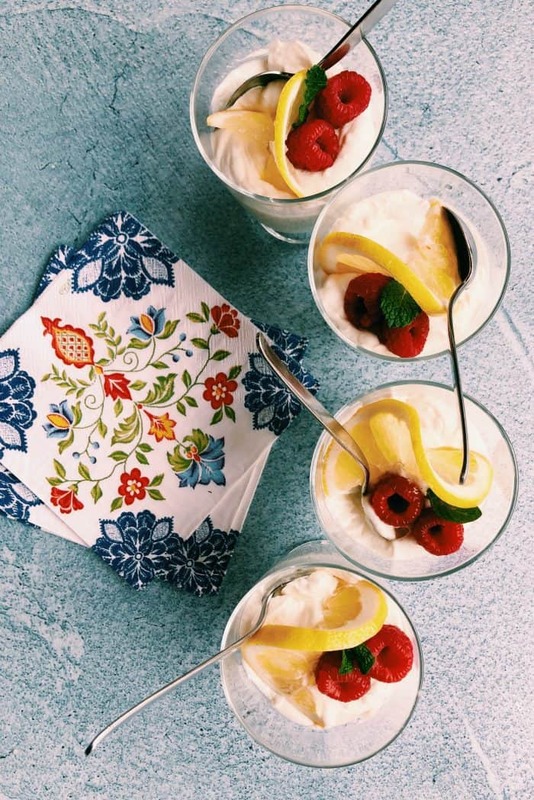 Friends, just in time for spring and summer, enjoy this Light Lemon Cheesecake Mousse recipe. 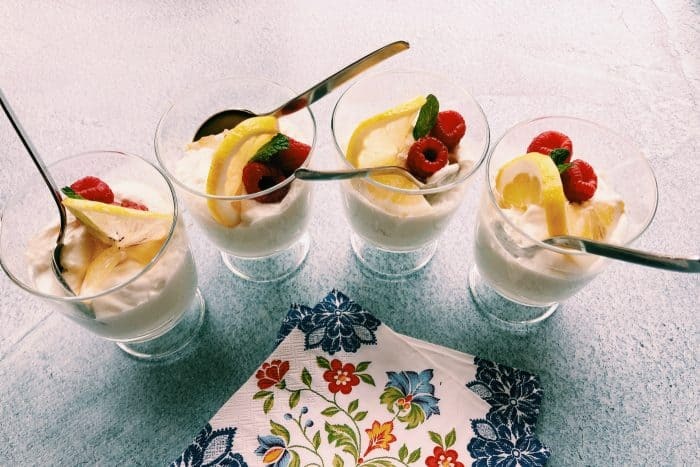 Here’s what I love … you can serve it in small ramekin bowls or parfait glasses! Follow these simple steps that include making and storing in the fridge ahead of time! Don’t you love a recipe that you can make the day before? And that is perfect for company!? Make sure and use light cream cheese! It works beautifully in this recipe! Add the lemon curd! Take another quick taste with your finger. You can adjust the lemon flavors by adding more curd if you want it super tart. Pour into ramekins or parfait glasses. Garnish with a lemon slices, lemon zest, strawberries or raspberries, fresh mint leaves. Here’s the beauty of this recipe. You can garnish with any fresh fruit! So a slice of lemon or tangerine, any kind of berry, and a sprig of a fresh herb. Lemon it was! But who says no to chocolate? I have another delicious Chocolate Mousse Recipe on my blog you just may want to try! What a yummy dessert, perfect for Spring and Easter and Mother’s Day. Make ahead and store in the fridge. Here’s a light spring menu to try this month if you’re hosting! 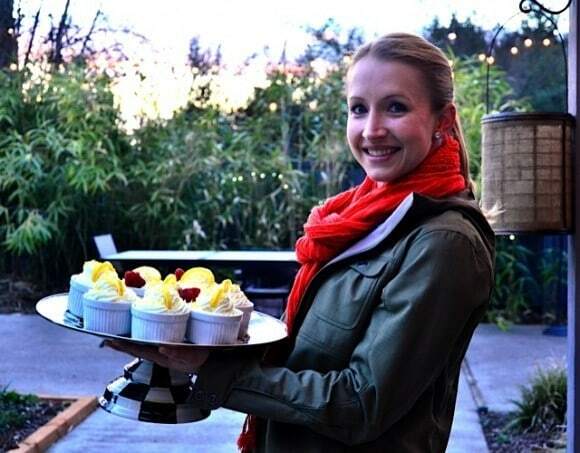 But the best part … this dessert! Wouldn’t you say that many hours around the table of good food and talk is the BEST? More cheesecake recipes: Cheesecake Cake Batter Dip [Wine and Glue], No Bake Guinness Chocolate Cheesecake [Melanie Makes]. In a large mixing bowl add the whipping cream, cream cheese, and powdered sugar. Beat until stiff peaks form, about 3 minutes on high. The mixture will be light and fluffy. Add the lemon curd! Take a quick taste with your finger. 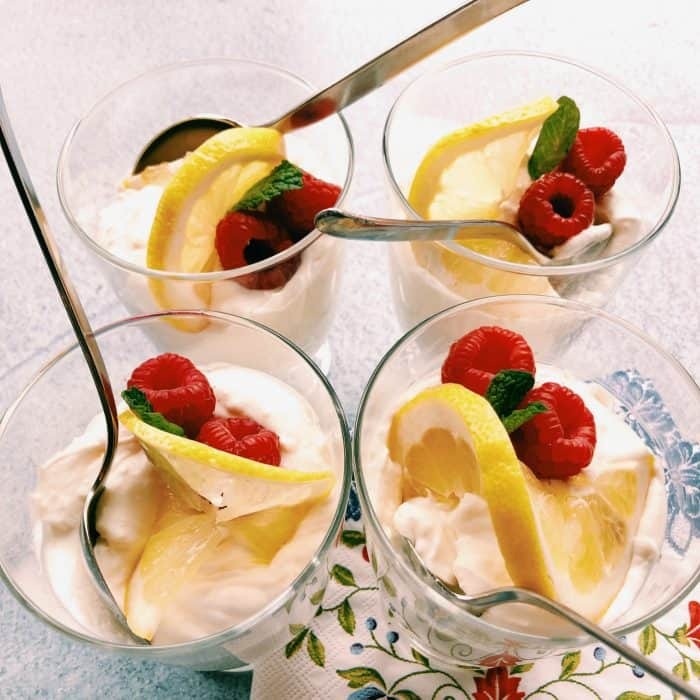 You can adjust the lemon flavors by adding more curd if you want it super tart. 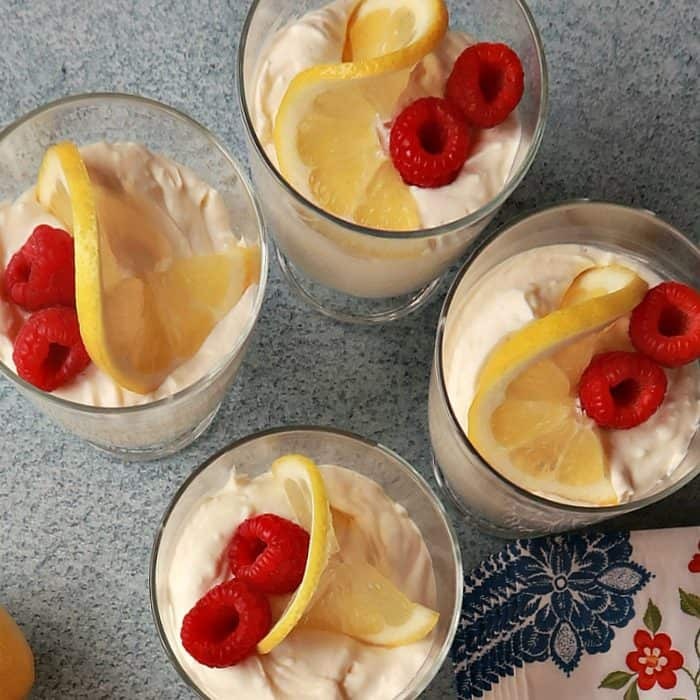 Pour into ramekins or parfait glasses. Garnish with a lemon slices, lemon zest, strawberries or raspberries, fresh mint leaves. Yields (5) 4 oz. ramekins or (4) 1 cup servings, (8) 1/2 cup servings. Easy to make the day before hosting! If you are going to refrigerate more than an hour before serving, cover with plastic wrap until ready to serve. I LOVE meyer lemons! 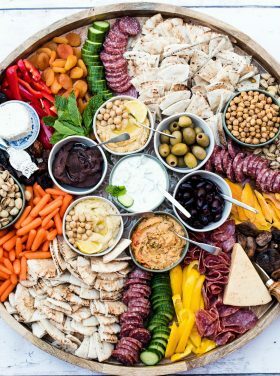 This looks like a great recipe for an Easter luncheon! Confession: I don’t normally like lemon desserts (weird right?) but I would be all over this!! So light and creamy!! Oh my, these look heavenly! And perfect for spring and summer. This looks so delicious! I’m heading to my lemon tree right now to get started on this one. Oh and after dinner conversations are always the best! What a perfectly pretty dessert for spring, love it!! Yay for Meyer lemon season! These sound delicious! What a great idea for a fun, light dessert. And I like the individual serving size. Looks like a fun time by all! I’m loving all things lemon lately, I know I would just love these! I don’t usually volunteer to bring dessert anywhere but I can see myself making these for a gathering. Your niece is so pretty! Beautiful Sandy! LOVE this recipe. So pretty! Yum, what a refreshing dessert! 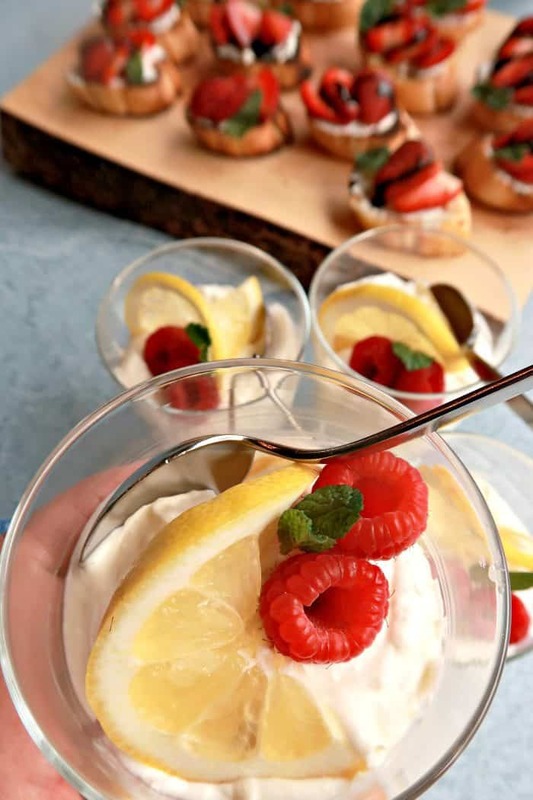 It sure is Meyer lemon season…I have some on hand right now and I think this sounds fabulous! These look so good. I wish I had one in front of me right now!! What a lovely spring dessert! 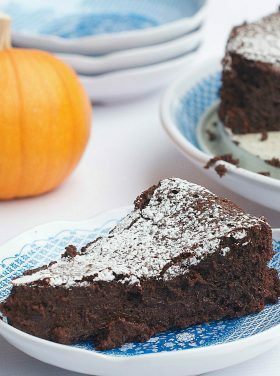 How do you think liquid stevia would work in this recipe? Yum! sounds really fresh and yummy!!!! Sandy. Oh my word. 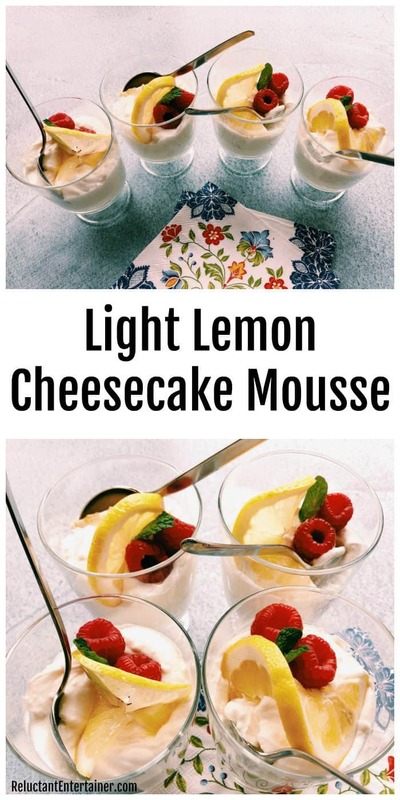 Cheesecake and lemon desserts are tied for my favorite sweet flavors ever – I don’t even think I could share! What a fun evening and how smart to use light cream cheese! 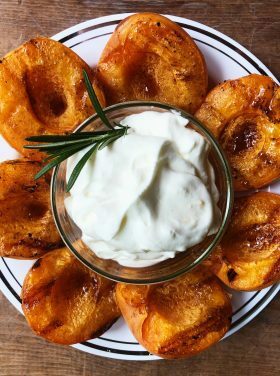 Totally made my day for you to have made a version of my recipe!